Here are the swatches of Essie Tart Deco… as you can see, on it’s own with top coat, the coral orange colour is quite tart. For me this is a shade more worthy of Spring rolling into Summer. Though, team Essie Tart Deco with an OPI Black Spotted (limited edition, only available in France) overlay; not only a different effect but you transform the look so that it appears more suited to the darker months… how amazing would this particular nail art effect look at Halloween? You cannot guarantee how OPI Black Spotted will react on each nail, it all depends on how long you have left the original base colour – in this case Essie Tart Deco – to dry. The Essie colour is easy to apply and gives good even coverage during application. I have previously found that Essie colours can chip very easily and quickly; however with the OPI Black Spotted overlay and a generous lashing of SpaRitual Top Coat, I did not notice any chips for at least 3-4 days… and that covered Christmas and a Birthday party. Definitely hard wearing and I was impressed! 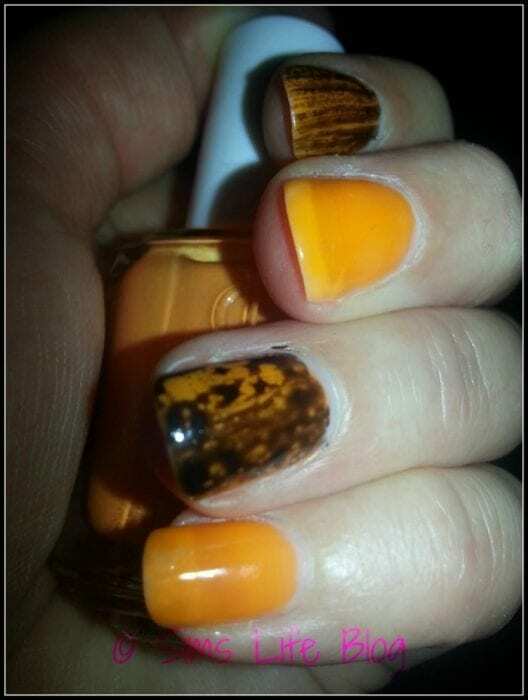 In a rush to produce the swatch – the Black Spotted OPI had different effects – though as you can see from the nail wheel swatch, when left to dry and applied correctly the overall effect looks amazing. Essie E-nuf is e-nuf first from the right. A range of Essie products can be found at Liberty. The QMSMosmetics Hand Care certainly has a luxurious feel to it, exactly what you would expect for £20 a time! Squeezing out in thin swirls with a greyish white colouring, less is definitely more as the cream gives very good coverage. With a thick consistency, the cream is perfect for the snowy weather we are enduring at the moment. With a non-greasy, quick drying, barely there scent, I find myself using it several times a day. There are no excuses not to take the Hand Care wherever you go – a handy pocket sized tube, hands are grateful for this treat!! The QMSMedicosmetics and Essie ranges are just two of many beauty gifts available at Liberty. The Body Shop Grapefruit Body Butter Helping My Find A Man Quest! The Perfect Beauty Goodies To Prepare For My Date With The Fireman!